A pressure relief valve for even more safety in your system! In common systems usually a standard reservoir suffices to level the occurring pressure differences. Also the parts installed in a system are usually pressure-tested up to at least 2 bar. But for users with seriously large cooling loops the extreme temperature differences between operation and standby may cause such high pressures that it is advisable to release the pressure to avoid damages. This pressure relief valve can, for example, easily be screwed into a T-piece and therefore be installed at any point of the cooling loop. Some reservoirs also offer additional openings which are usually equipped with plug caps. 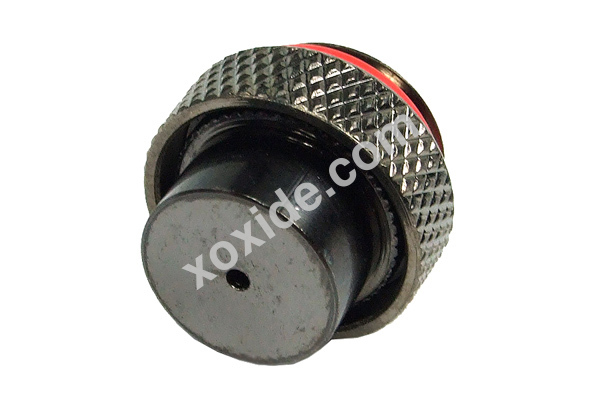 At these threads the valve can also easily be installed. Due to the g1/4" thread size and the short thread length of only 4mm this valve can also be used in just about any spot of the watercooling system. The low profile of the valve, only 16mm without the thread, also makes it very versatile. The O-ring seal at the thread also gives added security for your system. The valve releases at a pressure of 0,3-0,4kg/cm² or 4,3 to 5,7psi.